Amen! Live this! So true. Man do I struggle with this..anxiety..fear worry..negative chatter..please pray for me to overcome..I have been working on this for so so long. Any advice from this who have beaten this ? Thank you for the reminder. God’s word is truth. The Lord is my Shepherd. I have everything I need. He makes me rest. He refreshes me. He restores my soul. He leads me in paths of righteousness for His name sake. There is so much more. How Great is our God! Mary, it is a process. Be as kind and patient with yourself as you would to a friend who is going through similar circumstances. Be a student of God’s Word, focusing on who He says that you are through Christ. 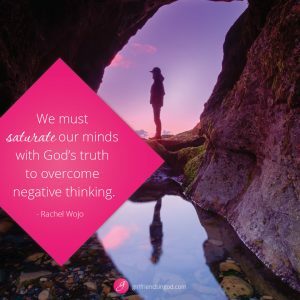 When you have anxiety, immediately stop the thought and replace it with God’s Truth. Whenever possible, listen to worship music. Pray and ask the Holy Spirit for His help. Immerse yourself in Him. He is the Way, the Truth and the Life! Amen! Thank you for the Scripture reminders!! I get the importance of holding onto and focusing on God’s words and truth. But yes it is so hard. I had a close friend say some things in anger a month ago. I can still hear it in my head. It repeats in my sleep. It is on “repeat play” inside my head. It would make much more sense for me to repeat what God thinks about me over and over instead. But some how it’s just not what I am managing right now. God brought my eyes to this devotion as I have not made time to glean from His work. 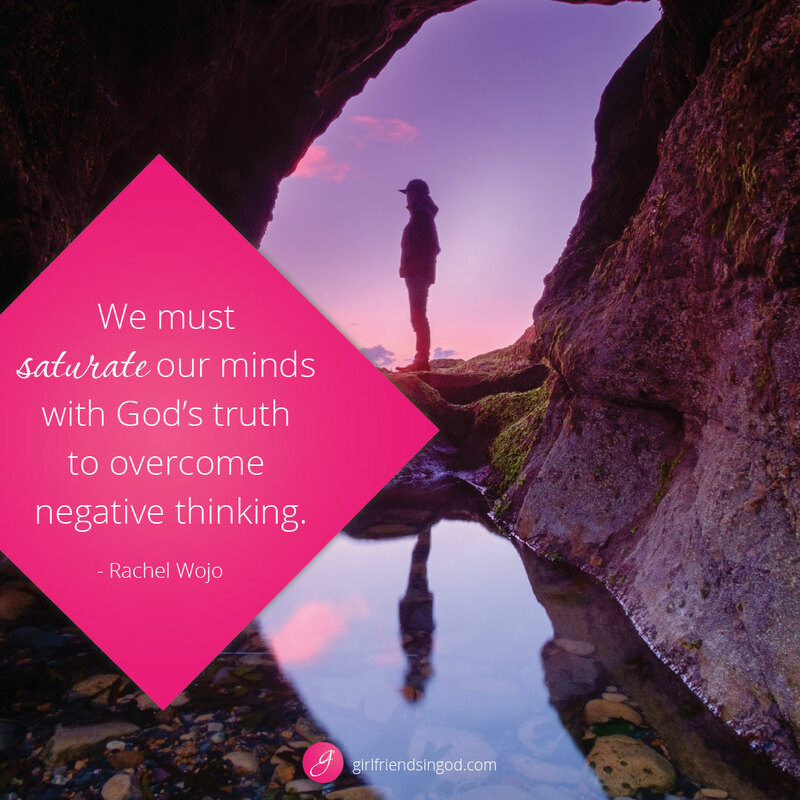 Struggling with my husband’s mistake of unfaithfulness and trying to be positive and not make it about me and what I must lack as a Godly and desirable wife for him to have been able to engage. This was just what I needed. My strength is found in Him, the Lord! I am reminded by The shared scripture Psalm 34:18. The Lord is close to the brokenhearted and saves those who are crushed in spirit. Thank you so much! And so my journey begins. My comment is in response to Mary. If you have prayed, and meditated on and read Scripture, and talked with Godly friends, your pastor etc without any relief, I would suggest that you talk to your Dr about medicine for anxiety. I think most people have some anxiety/worry at times, but when the anxiety is overwhelming your life, it’s horrible. I will be praying for you. I’ve got a new one now! To set the mind on the Spirit is life and peace. I desperately needed this. I recently accepted a long anticipated new position and by all appearances it should have been a smooth transition. I couldn’t have been more wrong. After 25+ years in my profession, having received high marks and accolades I find myself in a situation where every single moment is dealing with constant severely toxic people, negatively challenging circumstances and really bad decisions. I hate, no, despise this job unlike ANY other job that I have EVER held before in in my life! In less than two months I have seen my professional life pass before my eyes and I have been tempted to leave my field altogether because of what I’ve seen and experienced. I believe in excellence and order and I feel like I was brought in under false pretenses, but that’s neither here nor there. The evil swirling around me daily is bigger than me, but not bigger than God. I have a hard time with those negative voices telling me that I haven’t done enough and could do more- which is a lie when I KNOW that I am doing all that I can. I have people who have no idea of what my position involves telling me that I’m not doing enough, or not doing it “right”. I have NO problem with trying new methods, but they aren’t addressing the core issues at the foundation of the problems. My challenge is reminding myself that it’s not my place to try to change any of these people, and the way that they are isn’t my fault. God has me in this job for a reason, and it might not be for nothing more than for me to just put on that full armor every day and to STAND, or to maybe influence one or two people around me. I’m powerless alone, but with God’s help I can do all things. Thanks for this devotional! It is amazing how often I skip the reading of these GIG devotionals, and sometimes save them to be read later. However, whenever, I am facing a particular trial, I am always led by the Holy Spirit to “read the one for today!” Sure enough – just what my Dr. God ordered!